Varda is now 89 years old, and 60 years have passed since the 1957 publication of Mythologies. Yet it is remarkable how Barthes’s assessment of her work has held up; her images, both moving and static, exemplify an attention to a subject’s social function, continuing to dignify faces with frankness and humility. This approach is on display in her latest film, Faces Places, a collaboration with the French street artist JR, 55 years her junior, whose own large-scale photographs, mounted on the facades of buildings, magnify the ordinary and the unseen. 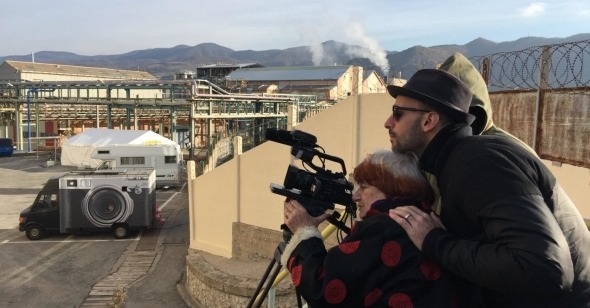 An itinerant film in the vein of her 2011 miniseries Agnès Varda: From Here to There, Faces Places finds Varda and JR on the road, taking photographs and installing large-scale prints in a variety of French villages. The subjects of their art lead modest, unpretentious lives, including a solitary farmer, a factory worker on the brink of retirement, an outsider artist, a waitress, and the wives of dockworkers. The film is also a portrait of the artists themselves, as they race against the clock of Varda’s age, battling her vanishing vision and memory. As a metacinematic self-portrait, the film is an extension of Varda’s recent string of personal documentary work beginning with The Gleaners and I (2001). Yet the film picks up on much older preoccupations; the interest in public, countercultural art, for instance, echoes Varda’s Uncle Yanco (1967) and Mur Murs (1980). The representation of Varda’s deteriorating eyesight bears traces of the corporeal vulnerability evident in films as early as her 1958 short essay film L’Opera Mouffe, in which she interrogates the public spectacle of her pregnant body. This time, Varda makes art out of her macular degeneration, weaving an eye injection into cinematic history by likening it to the sliced eyeball of Buñuel and Dalí’s Un Chien Andalou (1928). It’s also the first film she has ever co-directed, and in JR, Varda finds an energetic and sympathetic artistic counterpart and companion. They shot the film one week a month for a year and a half, a pace that was both comfortable for Varda and allowed the two to work on other projects simultaneously. Their blossoming friendship offers some of the film’s most memorable images. JR flies behind Varda’s wheelchair as he pushes her through the Louvre, in a variation on the famous scene from Jean-Luc Godard’s Band of Outsiders. They dance and sing along to Anita Ward’s “Ring My Bell” as they travel from village to village in JR’s van. And at the end of the film, he comforts her after they are stood up for an appointment by Godard in Rolle, Switzerland. Their camaraderie in the film is touching and real. As we caught up with the two artists at Cohen Media Group’s offices in Manhattan, JR gave Agnès back rubs in between interviews. He ended our own interview by reminding her that it was time to take a nap. Reverse Shot: Agnès, when I first met you in 2013 you were taking a nap on a couch in your editing room on Rue Daguerre, taking a break from editing video for an upcoming installation at the Fondation Cartier. JR: She likes to do that. Agnès Varda: I do that. But we no longer have that editing room, which I regret. We had to sell it to raise money to make the film. AV: Which you knew was a copy of a photo I took in 1956? AV: That’s interesting that we met without knowing each other by working in Marseille. JR: How much time separated these works? RS: I believe they were made in the same year, 2013. AV: So we did something in Marseille together without even knowing it. AV: I have to say that many times in the past, we have been brought together by geography and chance. I took pictures in Shanghai, and he did the same. I did images in Havana, he did too. RS: Both of you got your start in photography. AV: I had been a photographer for ten years before I began making films. I was doing my own compositions at the time. I felt I could be an artist, but to make a living I was doing other things. I took photos of children in their families—oh, my god (laughing). I had to make a living. And it became obvious that I could do other things than that. When I switched to cinema, I kept taking some photographs, but not that much. And I regretted it. Once I went to Mexico. I took a big trip, and I didn’t take my camera. I remember images so incredible. Why didn’t I take pictures? Sometimes, I didn’t want to be just a photographer, I wanted to live and enjoy life, which I did. But I would love to have the images. So sometimes I didn’t take enough images. My Rue Daguerre neighborhood in the fifties was incredible. I should have taken more pictures. I did a film in ’75, Daguerreotypes, which already looks passé. RS: It looks fresh to me. JR: It’s an amazing film. It didn’t age at all. RS: And you see a bit of Rosalie in the film too. Is Faces Places the first film of yours Rosalie has produced? AV: Yes. She was helping me [before]. Because the company that I run, I created it for La Pointe Courte. And I was tired of doing it. So five years ago, with my son, they started to say that they would run the company. She did a lot to help out. And then for this film, she really produced it. She found the idea. And by the way, she is the one who introduced us. JR: Yeah. That’s how we met. AV: They always say that the producer is the one with the ideas. On that level, she was the producer. She did a hell of a lot of work to find the money so that we could do it the way we wanted to do it, which is not caprice but very special. We did it over 18 months, you know. We couldn’t keep the same crew at our disposal, so we had to sometimes agree to another crew. RS: Agnès, when I met you in 2013, you said you were done making films. AV: I was not done. I said I don’t want to do another film for theaters, for distribution, because I was working a lot, as you know—installations, exhibitions, and so on. What do you mean I was done? I was not finished; I was no longer in distribution. And here I am, promoting a film for distribution, which is so difficult, because if we could make a film and send it like this (gestures) and then people could come and see it for free, oh my god, that would be a dream. We want people to see the film. AV: And then we said it should never go longer than 90 minutes, because a documentary should not start to bore people. We knew what the limit was. JR: So we stopped at that limit. But it really took us a long time before we agreed that we were making a film. We tried to escape from that, thinking “we’ll do a 55-minute thing, we’ll do something for television, we’ll do something for the galleries, we’ll do something very abstract. We won’t do something anymore.” And then at some point we thought, maybe there is something. AV: We got caught. Going from one place to another in this magical truck. I fell in love with the magical truck. JR: You fell in love with the truck, and not me. AV: The truck is a dream truck because it has a photo camera on the side. It seems small, but it makes huge posters. Magically enlarging life, enlarging everybody. What I do in my documentaries, we do the same thing—taking normal people, average people, people who have no power, and giving them the time to express themselves and to become more important. By making them big on the wall, it also gives them importance and light and life. So we agreed that that would be the project, to go in the magical truck from one place to another. But we weren’t always traveling in the truck. It is a bad quality car, I must say. AV: But it was fun. Because he’s driving, and I could sit near him and sing and enjoy. I love trucks, you know I have filmed a lot of trucks. RS: I love the way your film blurs photography, installation art, and cinema. I wondered what kind of conversations you had about the relationship between large-scale installations and the screen. JR: Agnès had always worked on the big screen, and the fact that I would enlarge photos, she was very fascinated by that. The freedom of enlarging images and putting them in the street was something that I remember from the beginning was a new playground for her. Knowing that we could play with how we would project it after. We didn’t have the idea of the film right away, but thought maybe it could be in the gallery, or in a different medium. Often in my work it is not about how big is the image, but it is about the reaction, the context. How do the people interact with it, who helped to paste it, and what does it mean at the exact moment that we are doing it. That is what is most important, not the final image. And Agnès understood that, of course, from the beginning, and that is why we had so much fun joining forces, because I could focus on the pasting while she could focus on seeing what was happening around. I’ve always dreamed of having a companion who could actually document some of the reactions that I’m missing while I’m pasting. RS: The selfie is a big part of the film. JR: The selfie—it was a question we asked ourselves, because when we walk together in the street, people ask Agnès for a selfie, and she says yes, but why? And then when we pasted the photos, people turn their backs to the image to take a selfie. So we asked ourselves about the selfie, and Agnès said, let’s do a little study of why people are doing selfies, what are they doing with them. AV: But we dropped the subject, because it’s another subject. JR: But we kept a few. AV: We kept especially the two people, where we did the portrait of their grandparents on the house. I loved it, because she doesn’t know how to use a [camera]. “Is it out of focus? I don’t see it.” But I loved it because it was totally gauche, but they did it anyways. But we thought we should not treat another subject, because it is such a big subject, you know, the reason for the selfie, what it means for the people. So you could do that in your next documentary, my dear JR.
RS: JR, do you remember the first film you saw of hers? JR: I actually began by watching The Beaches of Agnès (2008), and then I caught up on all the others. I was 22, 23. That’s how I caught up on her, and I wanted to know more about her. I already knew a bit about her but I actually discovered the scope of what she was doing through that film. AV: Then you went to see more of my films? AV: You found them through what, DVDs, streaming? JR: It was just the beginning of YouTube, so there was not much out there. But yes, DVDs, and stuff like that. RS: Were you making installations at the time? JR: Yes, I started in 2001. The first time I enlarged a giant photo was 2004. AV: (to JR) You didn’t see my exhibit at the Fondation Cartier, did you? AV: … tell the people to come, give them chairs and let them just see the film. They say I should be mad, because now people watch my films on their watch. JR: The Apple Watch. It’s coming.